This morning I clicked on Ubuntu Software and unfortunately decided to install the updates it found. It required a reboot and that now gives me a black screen. I can hold the Shift key down while rebooting and choose an old kernel and then log in fine, but would like to know what is going on. Or you could pass the kernel parameter nomodeset by editing the boot options line and adding 'nomodeset'. Thanks, but I'm afraid of messing up this kernel with another update. You are not messing with the kernel, you simply edit the boot command before hitting enter. The change only occurs for that boot. Just select the kernel, hit e and add nomodeset to the kernel line and hit X to boot. If it works, I can show you how to add that permanently. If not, just reboot and its gone. are you using an Intel video driver? I've had some issues with lubuntu 16.04 and funky/quirky displays. I am also on the 4.4.0 kernel series. Google-fu suggests there's something going on with intel-based drivers and video stack in Ubuntu right now. One person even posted "ironically, AMD and nVidia are in better places than Intel right now." I'd just boot with the good kernel until this gets resolved. Might even want to pin the good kernel until the newer ones are fixed, fwiw. Edited by Hedon James, 15 March 2019 - 07:15 PM. It is an nvidia driver. Not sure if I got this kernel today or before. After adding nomodeset it says does not recognize command. Put it between ro and quiet. I just found a random image of grub for reference. That sort of works. It boots to the sign-in screen, but after signing in it immediately jumps back to the sign-in screen and plays a drum roll. Possibly, your old Nvidia drivers (built on the previous kernel) will not load with the new kernel. You'll need to do a fresh install of the Nvidia drivers. I experimented on a second hard drive and found later versions of Ubuntu, 16.04.6 and 18.04, locking up within a few minutes of logging in. I remember having the same problem last year when I first tested 18.04 when it first came out. I have already lost 4-5 hours into this kernel problem and finally found a work around by editing the grub boot order. 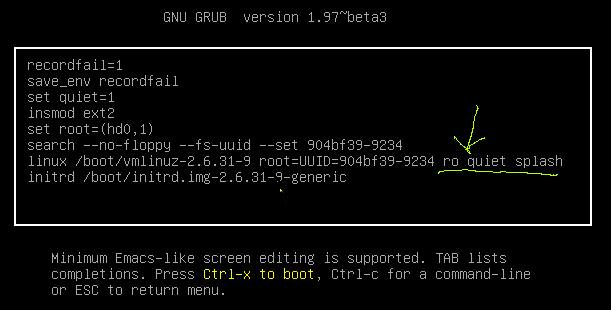 Then change GRUB_DEFAULT=0 to GRUB_DEFAULT="1>3" so it will choose the 4th kernel choice in the menu. Then Save, and sudo update-grub to make sure it really saved. Now it automatically boots into the kernel it did this morning before the ill fated update. Well that works but eventually you will need to update the latest kernel. Things like this is one of the reasons I love Archlinux. Archlinux package manager, pacman, would of rebuilt the nvidia driver when the kernel got installed. If there was a problem, you would been told before the update even started downloading (through pacman or from archlinux.org). The installation is a bit more involved but I find admining arch much simpler that the "easier" distros like Ubuntu and others. A lot of this has to do with all the custom patching that distros do to personalize their user's experience or other reasons. When you use vanilla packages from the upstream source as the dev intended, you end up with less breakage because things were originally built against the vanilla packages. Basically, your systems know what to expect. Ubuntu and others do a lot of testing but sometimes bugs creep up because of custom patching. I would do as Eric suggested and reinstall nvidia again. Just out of curiosity, could you give us the output from this command? PS, I do not suggest that you install Arch, I was just ranting. I do not think nvidia is the issue. Last night I tried installing 16.04.1 kernel 4.4.0-31, and then updated it, but without nvidia. It unfortunetly updated to 4.4.0-143 and while it let me sign in, it would lock up before fully loading the desktop. And after the update 4.4.0-31 also locked up, probably becouse it is too old. Ubuntu appears to be no longer compatible with my hardware. "...Ubuntu appears to be no longer compatible with my hardware." Hmm... I find that hard to believe. Most any Linux is compatible with older hardware. I'm not really up-to-date on Ubuntu (or Debian) these days, so I don't really know. Ah... well, what vid is the OP using? based on nothing more than what I've seen in this thread, I'd be looking squarely at the nVidia driver as culprit. Either pin the *142 kernel that works for you, or try to boot to the terminal with the buggy 143 kernel and update nvidia driver from a terminal, then login from that terminal. I believe Ubuntu is using lightdm as login service; I know Lubuntu uses LightDM. Side note...do you NEED proprietary nvidia drivers, or just prefer them? Or are you using the open source nouveau drivers for nvidia hardware? The installation is a bit more involved but I find admining arch much simpler that the "easier" distros like Ubuntu and others. I find siduction easier than "easier" distros too, even MX. Once you realise to abort upgrade when many packages are flagged to remove and just wait, it's fairly plain sailing. I don't suggest to install siduction either. I do agree with Hedon James though, completely uninstall Nvidia drivers and see if nouveau works ok. Nouveau works well for my system with GTX560 Ti. Using version 364.19 for a GeForce GTX 660. A couple of years ago I bought a Dell Desktop with the build-in Intel graphics from Goodwill for $25 and yesterday installed the 2nd (experimental) hard drive that was locking up in my main computer and it booted right up and had no issues. Every time I've ever upgraded a kernel on ANY of my Linux installations (Slackware, Debian, CentOS, etc. ), it was a MUST-DO to reinstall the Nvidia drivers. They must be built against the new kernel, modules, and headers or Nvidia will NOT function. I used to do this by booting into run level 3 (no X enabled) and run the Nvidia installer via command line. I still use this method in Slackware. I still say this is an Nvidia driver issue. The drivers you had installed (built) using the older kernel won't work with the new kernel. It's just not going to happen. Nvidia must be re-installed. NOTE: The above is only true if you manually installed proprietary Nvidia drivers downloaded from their site. If you installed Nvidia drivers from the Ubuntu repos, they should have updated with the kernel, I would think. Could be wrong, though. I haven't messed around with Ubuntu or Debian in quite some time. With the 2nd hard drive, a new clean install with the new kernel, it locks up too quickly after login for nvidia drivers to be installed. With the original hard drive and the new kernel it goes to a black screen and I cannot log in. If there is a way to install nvidia drivers in either case I am missing it. Stand by for help from some of the Ubuntu users, Robert. I'm not at all sure how Ubuntu handles Nvidia updates. The motherboard is a Gigabyte Z68XP-UD3P. A Google search turns up problems running Linux the last few years. Some say stay away from Gigabyte if running Linux. I run a couple of Gigabyte mobos and they are fine. The newer one has a setting in UEFI called something like "OS Type" which I had to change to even get Linux installed. Can't look now, but I have that one multiboot with about 6 Linuxii currently. #3 (if an update or something else...) has specific scenarios for nvidia users. Seems like you need to get booted into a terminal so you can manually uninstall nvidia and either use nouveau or reinstall nvidia against that 4.4.0-143 kernel.